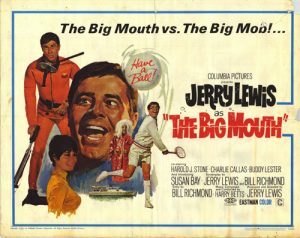 In The Big Mouth, Jerry Lewis plays the role of Gerald Clamson, a bank examiner on vacation who, while fishing, catches a frogman. The frogman, who coincidentally is the spitting image of Jerry Lewis, has stolen diamonds from his criminal gang, and hidden them at a nearby resort hotel. Clamson takes the map to the diamonds given him by the frogman, and makes his escape while the gangsters attack. At the hotel, Jerry Lewis accidentally injures the hotel manager, played by Del Moore, and so Jerry Lewis disguises himself as the title character from The Nutty Professor in order to investigate the mystery at the hotel. At this point, there are three different subplots running together – the criminal gang searching for Jerry Lewis, while he’s courting the love interest in the film portrayed by Susan Bey, while the hotel staff are looking for him in order to throw him out. Watching it again recently, I was pleasantly surprised to find that it wasn’t only a childhood memory — The Big Mouth is a very enjoyable movie. In it, Jerry Lewis plays a less frenetic, more rational character than normal, but is still quite funny, while leaving room for some of the other characters to showcase their own comedic talents, notably Del Moore, who keeps getting unintentionally injured by Jerry Lewis, and Charlie Callas, who plays the role of one of the gangsters. Since the ‘dead’ frogman is a dead ringer for Jerry Lewis, one running gag is that whenever one of the gangsters runs into Jerry Lewis’ character, the shock of seeing the ‘dead’ gangster unhinges them mentally, and Charlie Callas’ character is very funny. In addition, there are several small comedic moments, such as Jerry Lewis trying to launch a boat, and cameo roles by other celebrities of the day, including Colonel Sanders of Kentucky Fried Chicken fame. One other now-famous person that I noticed was George Takei, now best known for his role of Lt. Sulu on the original Star Trek series as a diamond smuggler. The Big Mouth is a very funny movie, and I recommend it, rating it 3 clowns out of 5. Unfortunately, it’s not available on DVD at this point.